Author John Jackson Miller has spent a lifetime immersed in the worlds of fantasy and science fiction. 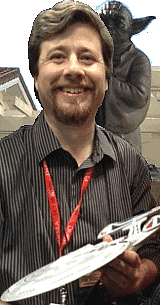 He's best known for his Star Wars work, including Star Wars: Knight Errant, his national bestselling novel from Del Rey; Star Wars: Lost Tribe of the Sith; and his long-running Knights of the Old Republic comics series from Dark Horse. He's written comics for Mass Effect, Iron Man, The Simpsons, and Indiana Jones, and has written for the Star Wars Roleplaying Game. Production notes on all his works can be found at his fiction site (farawaypress.com). John Jackson Miller is currently considered a "single author." If one or more works are by a distinct, homonymous authors, go ahead and split the author. John Jackson Miller is composed of 5 names. You can examine and separate out names.